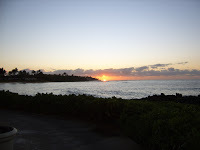 This past December and January we at Camai Bed and Breakfast vacationed in Hawaii, Kauai to be specific. The Alaska winters are beautiful as shown in this time lapse of Cook Inlet. While beauty surrounds us in winte, daylight is short. I crave the light. Almost every morning of the vacation I got up well before sunrise and set out on a walk. Some mornings I walked toward a place with a good vista for sunrises. The south shore where we stayed had no view of the sunrises. 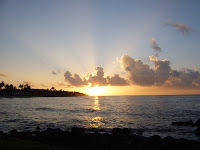 Every sunrise I saw was beautiful and unique. Afterwards I walked back to our accommodation and enjoyed just being able to walk without extra outer wear. While Kauai is the garden isle and a great place to get away from Alaska’s long winters, I am glad to be back home in Alaska with all the activities an Alaskan winter affords. 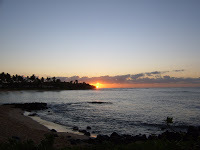 This entry was posted in Uncategorized and tagged Alaska winter, Hawaii vacation by admin. Bookmark the permalink.